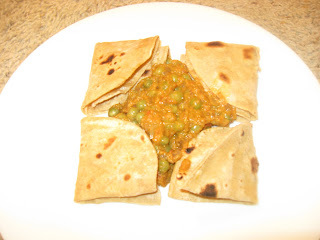 I had this Greenpeas Masala Dosa in a hotel when I was in India.I too want to try this at home with dosa rather than chapathi...As we Usually make Aloo Masala for Dosa at home..I was bored with this aloo masala..I loved the taste of this wid Dosa..but my hubby told that this will b very good with Chapathi too...Now its upto you to select a good go with this greenpeas masala...here is the recipe..
1.Add 2 chopped onions, tomato, broken cashew, cinammon, cloves, cardmon, ginger garlic paste, poppy seeds, chilli powder n salt to a blender add littlewater and make it to a fine paste. 2.Pressure cook the soaked peas for 3-4 whistles.Drain them n put aside. 3.Now pu t a pan on flame n add little oil.Once the oil is heated add cumin seeds n 1 chopped onion.Fry till the onions are soft. 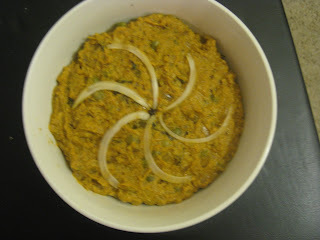 4.Add the ground masala and fry till the raw flavor is gone away. 5.Finally add the boiled peas. 6.Cook till u see the oil oozes out. 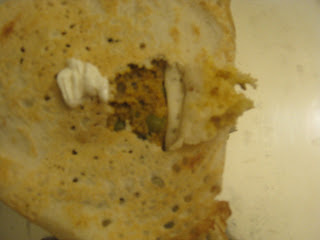 8.Serve it Hot with Chapathi or Dosa.